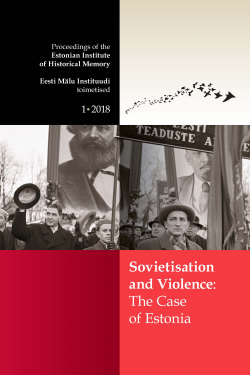 The first volume of the Proceedings of the Estonian Institute of Historical Memory, entitled Sovietisation and Violence: The Case of Estonia, contains articles by members of the Institute’s research team and historians associated with the Institute of Historical Memory, some of which have been published previously in Estonian. These articles focus primarily on the most violent period of the era of Soviet occupation, the latter half of the 1940s and the early 1950s, when tens of thousands from Estonia’s population numbering only one million were imprisoned for political reasons or deported from Estonia. These articles do not focus exclusively on overt political terror, including the deportation of March, 1949, rather they also examine more theoretical questions. They consider the policies of the Soviet Union’s central authorities in the newly occupied countries, along with other questions such as the taxation of farmers at rates that exceeded their means in order to force them into collective farms, and the use and exploitation of the recent past for propagandistic aims in the form of historical texts published by Soviet State Security. The world-famous researcher of the history of Eastern Europe and member of the Learned Committee of the Estonian Institute of Historical Memory, Stanford University Professor Norman M. Naimark, has written the preface.